THANK YOU, BOONI!!!! Love your eyes and ears!!! Well, it was a mixed-bag weather day. The rain only showered here & there, then stopped, the wind kept up, the sun came out, then it*d start all over again. We headed out for another look around 4pm in the sunshine. There were still many whitecaps on the water, & a rainbow! But nary an Eagle in any tree that i could see. 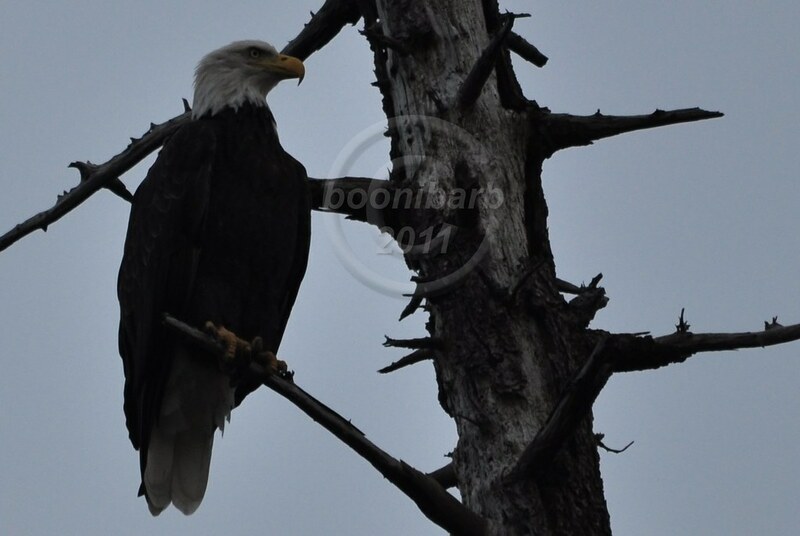 Like all of us, I am looking forward to Mom and Dad's return to Hornby - along with all the other Eagle Moms and Dads. We are so blessed to have a great Ground Obs team! What a wonderful thing! I was thinking last night that there were several days between Dad's arrival and Mom's last season. I want to be optimistic that they both will return. I want to believe that on their return trip to Hornby, Mom may have shown Dad the reason she arrived 1 week later than Dad last season. Perhaps there is another place to eat their fill of fresh fish before returning to Hornby and laboring as they do to fix their nest for the next nesting season? I don't know anything of course, but that is my current wish. Thank you for the Updates Booni!!! Well, i went by this morning around 11am & again around 5:30pm. It was a blustery windy day. A morning & an evening drive through the neighbourhood. Thanks so much for keeping an eye out, Booni!!!! You are our eyes and ears!!!! Thanks for being our eyes and ears, Booni!! Okay, so on our morning bike ride, Dooki & i visited the Wiig & the Brig Nests. After we passed the Wiig Nest, i heard what i thought were the gulling sounds, sort of, of a female Eagle. But i wasn*t positive that was what i was hearing. We carried on to check out the Brigantine Nest. Passing the same area near the Wiig Nest, i again heard the gulling sound, only this time i heard an answering trill. i couldn*t see anything from where i was, so i went to investigate. i couldn*t find the source of the gulling sound, nor did i hear the sound again. There was another sound coming from the beach, a water or shore bird. So i looked to where i heard the trill coming from. Once i spotted them, they flew off. On our evening bike ride, i had to go elsewhere before cruising the Nest neighbourhood, but there is a spot i can look from & sometimes spot the Nest or the Babysitting Tree or Gregg*s Tree. Was that someone in the top of Gregg*s Tree? i circled back & looked again. Could be just branches & leaves, but that could be an Eagle. It was getting dark, but i thought i could see a white head. i had to bag my original plan & go have a look. It was an Eagle alright! As i watched, they did that body language that told me they wouldn*t be there long. Would they wait for me to go get my camera? We barrelled home & bagged the original plan. When we drove back with the camera, there was no Eagle in Gregg*s Tree. So we drove around the neighbourhood, looking for them. i spotted an Eagle in Fosters*s Fir! Now, i don*t know for sure that this is Mum or Dad. It could be the Eagle that i saw near the Wiig Nest this morning. But they DID use Gregg*s Tree & Fosters*s Fir, Mum & Dad*s trees. i don*t see the staining around the beak that Mum had before she left. & this Eagle*s head feathers don*t look as grizzled as Mum*s do. Too slim, top of head too narrow. They just didn*t behave like Dad. It is so nice to see a current eagle picture. Looks like dad!! Oh such news is so promising and lifts all our spirits! Thanks to you Booni and Wren for all you do for us !